This Saturday Greg and I set out to paddle the upper portion of Salt Creek near Okmulgee, Oklahoma. As you may recall, I've been paddling the lower portion of this creek quite a bit lately. The upper portion of Salt Creek feeds Dripping Springs Lake. The creek comes into Dripping Springs Lake from the southeastern corner. The closest way that I know of to reach it is to paddle southeast from the fishing dock at Clovis Point. You have to cross more of the lake than I would prefer to paddle this little tributary, but once you reach the creek there is some lovely, well-sheltered, flatwater paddling. The fall color is starting to really dress up the area. Also, the reduced lake traffic of this season has resulted more wildlife visibility. Greg and I saw loads of ducks, cranes and turtles, but the highlight of the trip was seeing two mature Bald Eagles! These were the first Bald Eagles I have ever seen in Okmulgee County and the first time I have ever seen two interacting with one another. They entertained us for about 15 minutes with their awesome and inspiring airborne antics. It was glorious to behold, but sadly I was too dumbfounded to get any pictures worthy of uploading. I hope Greg had better luck. Thankfully, the 12x Zoom on my Panasonic DMC-FZ8K did allow me to capture shots good enough to show Dianne the Eagles we saw. 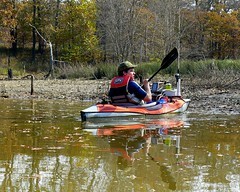 Greg had his Advanced Elements kayak loaded for bear with: a fish finder, rod holders, tackle box...the works. He caught a nice little bass at the entrance to Upper Salt Creek. As usual, I was too lazy to even attempt fishing. Now that I have spotted both Ospreys and Eagles on this lake, I am even less likley to do any fishing in the area. I'll be too busy hunting with my Panasonic FZ8 ! Paddling to the creek can be a little scary, if you have never paddled Dripping Springs Lake before. The lake is a fairly new one, so it is still full of old drowned tree trunks, stumps and stuff. When paddling this water you WILL definitely paddle over some of these stumps unexpectedly. Be warned, but be calm and most importantly be prepared. Paddling this water without a PFD is just plain stupid, so don't do it. Once you get onto Salt Creek the old stumps clear out and the water is much narrower and shallower, but when you are on the big lake water paddle slowly and remember to brace when you become unsteadied by an obstacle. Lower Salt Creek is much easier to access and safer to paddle, but I have never seen any Eagles on that trip. Another surprise I got on this trip was meeting another kayak photographer. Greg and i met Kevin paddling his big Dagger kayak down Salt Creek after a morning of taking pictures. He said he has paddled both Upper and Lower Salt Creek quite a few times. We only visited briefly, but it looked like he was rocking a cool SLR camera and zoom lens. I should have invited him to join our new Oklahoma Flatwater Paddlers group, but it slipped my mind and I didn't water to interrupt his adventure with too much uninvited dialogue. Afterward paddling, Greg and I met up with Dianne and grabbed some Mexican food con cervezas in Okmulgee. He is still plotting out a short trip through the locks on the Arkansas River near Webbers Falls, so be expecting more news on that later. More Pictures from Okmulgee's Salt Creek on Flickr. Thanks for the comment, Thomas. I've retired the Perfunct o blog. If you'd like to add me to your blog roll, please use tallasi.blogspot.com.